MANUFACTURER's NOTE: Be sure to check where this item ships from - non-US based vendors may not be shipping authentic TCP items. Make sure shipping times are less than 10 days. PERFECT BR40 LED BULB!! Have tried several other bulbs and waited over 2 years for this bulb to arrive. After waiting over 2 years to convert the home to LED BR40; I finally made a decision. I have 80 bulbs in the house and have to change out 3-4 bulbs a month. Gets old very fast. CFL looked cheap in my cans so I skipped that technology. The LED technology is growing fast; but still very new. I was concerned about quality issues; so that is my primary concern. Phillips BR40 LED. I first tried a couple of this $40 bulb but did not like the silver trim around the bulb. Does not allow one to mix/match bulbs as technology changed. I waited another year. Sylvania Ultra LED 1100 lumens at Lowes. Tried 15 of them; but they were way too bright. My entire family voted them down. The color was also a little whiter that the dull 65watt incandescents. Ineeded more light; but the 1100 was too much of an eye strain. Feit BR40 LED. Tried to get some; but found it difficult to find. Home Depot and Lowes don't carry. I see a few Feit products at Walgreens; but now am wondering about their quality control (3 year warranty). Lowes does sell their Utilitech LED but I think is is rated 1065 lu (too bright for me). FINALLY the TCP bulb. It carries a 3 year warranty. 900 lumen rating. It is a tad brighter than my dull incandescents; but definitely does not cause eye strain. A very pleasing brightness and warm 2700K color. 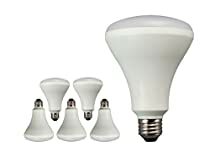 In regards to quality; Walmart contracted TCP to produce their own line of LED bulbs. TCP also available via Home Depot online store (but non-dimmable). Amazon reviews of their A19, BR30 and BR40 are well above 4.5 stars. These are definitely the bulb of choice. Could not buy 80 bulbs at one time via Amazon Prime. I bought as many as I could at one time (4-16 at a time) which took about 2 weeks and 10 orders to get a total of 80 bulbs from Amazon. Still the best LED BR40 bulb on the market and the price is now only $16 instead of $20 (should take less than 2 years to recoup cost). A friend bought the Feit BR40, but there is definitely a lag so it is not really an "instant" on bulb. Phillips just posted a new bulb but only has a few reviews. ALL bulb are working great. No problems. Truly instant ON (may 1/10th of a second). I had added another 10 bulbs for outdoor usage in the patio and they too are working great. I used to put up any incandescent bulb at hand to the ceiling recessed cans. Now since LED's last too long and expensive, I tried to figure out what type of bulb should I use for my cans for the next 20 years. The integrated LED's are good but that's some work to replace the cans and they are more expensive. My cans are of the enclosed type and they are in decent shape after decades of life. I got a BR30 and they looks fine and less expensive. Then I figured out that my cans are designed for BR40. They looked perfect in my cans, almost like integrated LED's but if you look at the bulb directly you can see a little gap. For BR30 you see a smaller bulb, and it's more recessed into the can. Thought a BR30 still looks much better than the most common kind of incandescent bulb. 5000K is fairly standard for daylight bulbs. I need it for my wife's makeup lighting. If your makeup looks good in the evening with all the indoor warm lights, you may not look good outdoors in daytime. Most business indoor lighting use daylight so you don't feel sleepy, and can tell the subtle difference of colours. Warm colour temperature is for relaxing and to match incandescent bulbs. A pair of this bulb feels brighter than 85W equivalent. Maybe because of the colour. There's absolutely no power on lag. Never tried dimming. Quality bulb! Solid. Nice color light and right lumens for my applications. In the process of converting all bulbs to LED's I've used a number of these bulbs. For my indoor, ceiling, recessed 'can' fixtures, this bulb has all the qualities I wanted. Very solid feel (has a metal base that has been lacquered white. Classy look, although for my application the base does not show). Globe is a frosted, heavy plastic, so the light diffusion is good, and does not have a single beam spotlight appearance, which for my purposes is exactly what I needed to evenly light a full room. Only items to be aware of: globe is very slightly larger than BR40 incandescent bulb replacing, which meant that the holder on extension pole installer was too tight to fit easily into the ceiling can receptacle, so had to use a ladder and hand-install bulbs. Also, price is couple dollars more than a few other BR40 LED's I used, but still competitive. 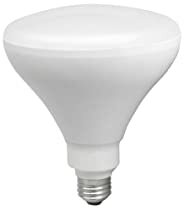 After using one of these as a test bulb, I decided they were well worth the money. LED prices will probably drop as more mass production; and especially now that I've already totally converted house to LED, ha.